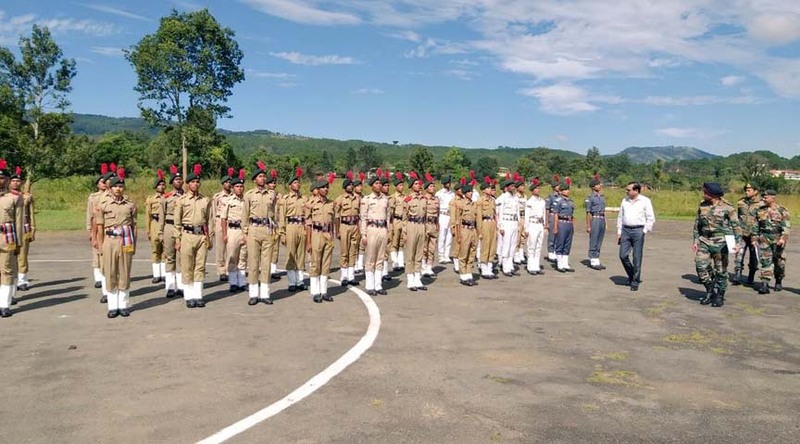 National Cadet Corps (NCC) Maj Gen Raju Chauhan, Additional Director General (ADG), NCC Directorate, NE Region, visited the training and selection camp at Umroi Cantonment in Meghalaya on Tuesday. According to information, around 500 NCC cadets from all eight States of the northeastern region have participated in the 10-day-long training camp. The combined annual training camp and inter group competition began on October 28, 2018. The training camp, being organised by the NCC Directorate, Northeast Region, is being conducted at Umroi Cantonment. The camp will conclude on November 4, 2018. As per report, the camp is being conducted under the aegis of the NCC Group, Shillong. The aim of the NCC training camp is to develop spirit of comradeship, team spirit, discipline, leadership, character building, self reliance among the NCC cadets. The cadets will participate in various competitions on drill , firing , weapon handling , Guard of Honour, cultural, flag areas, etc. during the training camp. It has been reported that the selected cadets of the National Cadet Corps, will represent the North Eastern Contingent at the next Republic Day camp to be held in the national capital. The selected NCC cadets will get opportunity to participate in the Republic Day celebration in New Delhi. According to media reports, the inaugural address was delivered by Brig PM Bali, Group Commander of the NCC Group Headquarters at Shillong.